Inside: Flag Ponds Nature Park is a hidden treasure that will delight your kids with opportunities to find shark’s teeth and shells, and to play in the sand! I had planned a really special Mommy-daughter adventure and it was not going well at all. I didn’t realize how tired my 3-year old was. She was quite tired, a little hungry, and a lot overstimulated. We had just spent about 2 hours at a super fun fairy festival, but we stayed about 20 minutes too long. In those 20 minutes, my daughter melted down about five times and I ended up having to carry her back to the car because she was getting a blister on the heel of her foot. Not how I envisioned the day going. I still had a few tricks up my sleeve though. So, we stopped for an ice cream cone (That helped her mood tremendously. Ice cream always does), and then made a bee-line for this great ‘hidden’ beach I had heard about. 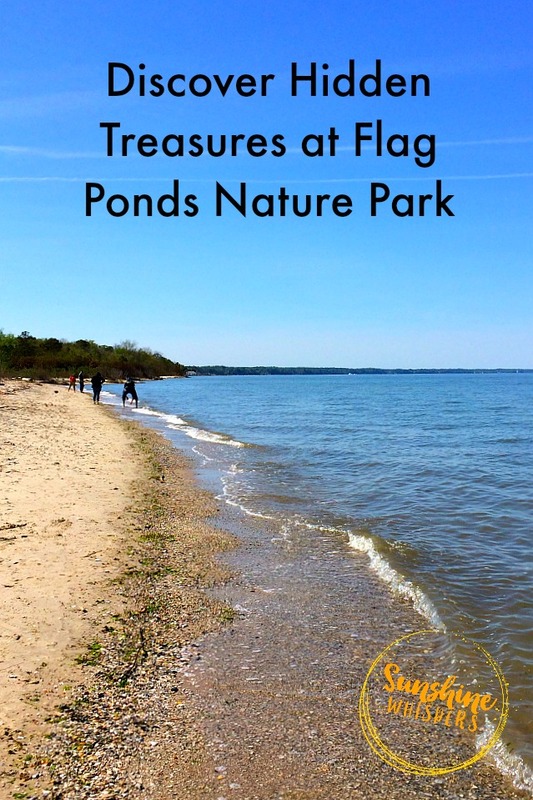 Flag Ponds Nature Park is not nearly as well known as its Chesapeake Bay beach cousins to the north. That is just fine with me though, because when we arrived, we practically had the beach to ourselves. Then, for the next 2-3 hours, my daughter lost herself in play. 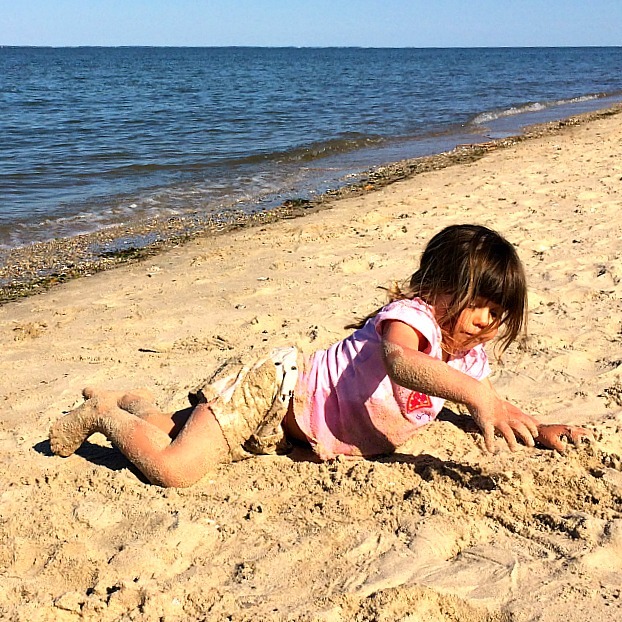 She splashed, dug in sand, hunted for treasures. At one point she even pretended to be a bulldozer and plowed headfirst through the sand. Did I mention she likes to be silly? Spending the afternoon at the beach literally transformed her from a whiny temper tantrum on steroids, to a reasonable, affable, curious, and hilarious little girl. This too, was not how I envisioned the day going. Nope, this was better. This was much, much better! 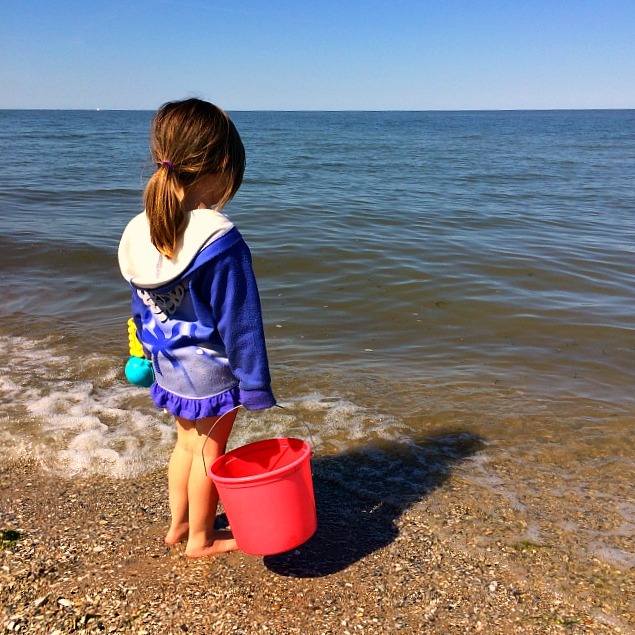 Many people have heard of the impressive Calvert Cliffs State Park because of the the possibility to hunt for shark’s teeth and shells. 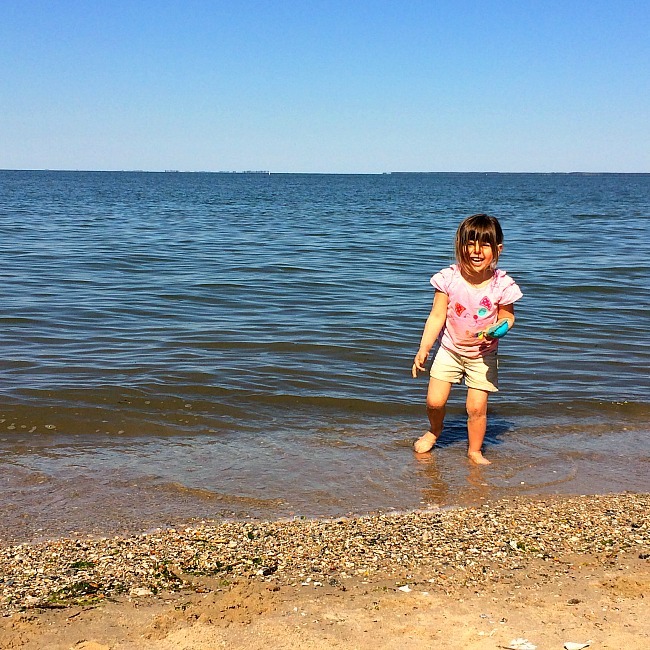 However, if you are visiting the Chesapeake Bay with young children, Flag Ponds Nature Park, which is practically next door in Lusby, may be the better alternative. There are two parking lots that are both fairly close to the trailhead. At the edge of the main parking lot there are restroom facilities. There are also bathrooms, and an outdoor shower/foot washing station just before you get to the edge of the beach. Once you park, there is a short 1/2 mile hike to the edge of the beach. 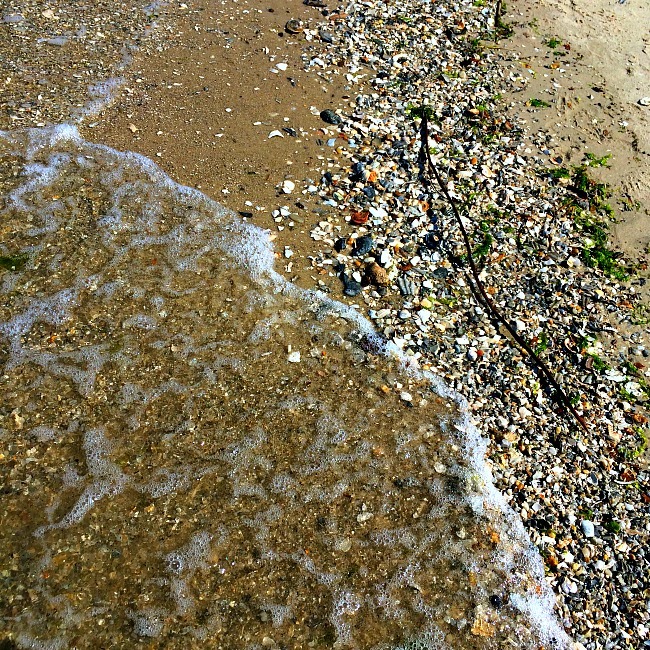 Then, you will likely spend another 10 minutes walking on the sand in order to get to the water’s edge. If this sounds like a lot of work, just keep in mind that the hike out to Calvert Cliffs in 2 miles. The only downside (and trust me, it is a downside at the end of your beach day), is that the hike to the beach is down a rather steep hill. That means, yep– you guessed it– getting back to your car will be a rather steep uphill trek. It actually isn’t that bad. My 3-year old walked back up just fine, but with two caveats: we visited in April when it wasn’t hot and we took a few breaks to gather treasures on the way. Don’t wait until your kids are already worn out to call it a day. Don’t go to Flag Ponds Nature Park on the hottest days of the year. Consider packing your gear in a little wagon. You could easily fill most of the day playing and exploring at Flag Ponds Nature Park. The shark’s teeth plentiful, even though they are a bit disguised among the pieces of broken shells. There are tons of shells, rocks, and other doo-dads (like driftwood). Your kids will love exploring and picking up treasures. We ended up with a big bag of nature treasures to use for crafts and activities at home. I think my daughter loved playing in the sand the most though. If you forget your beach toys, there are some available at the entrance to the beach. This isn’t an official service provided by the park or anything, but it is a nice touch. Still, plan to bring your own beach toys. We didn’t visit in the summer, so swimming wasn’t a huge priority for my daughter. However, we did get our feet wet, throw things into the bay like sticks and rocks, and generally splash around. What I loved the most about our day trip was that Sweet Pea was totally engrossed in play, and I could just close my eyes and listen to the waves ebb and flow on the shore. That was so, incredibly relaxing. In the summer months you will likely want to swim. I feel obligated to mention though that according to a few reviews on Trip Advisor (yes, I check the reviews religiously for insider details! ), at times the water will have a high concentration of jellyfish. Also, some reviewers did not like the murkiness of the water. If you are primarily wanting a swimming experience, Flag Ponds Nature Park might not be your best choice. If you want to play in the sand and collect nature’s treasures, this is the perfect place for you! As mentioned earlier, there is a nice restroom and outdoor shower facility about 100 ft. from the entrance to the beach. We were able to clean all the sand off of us, change clothes (for my daughter), and clean all the sand toys. Hiking back up that hill isn’t as horrible as I imagined it would be (again, we were there in April). One of the things that my daughter loved was collecting more of nature’s treasures. This time though, we loaded up on the huge pinecones that were everywhere. 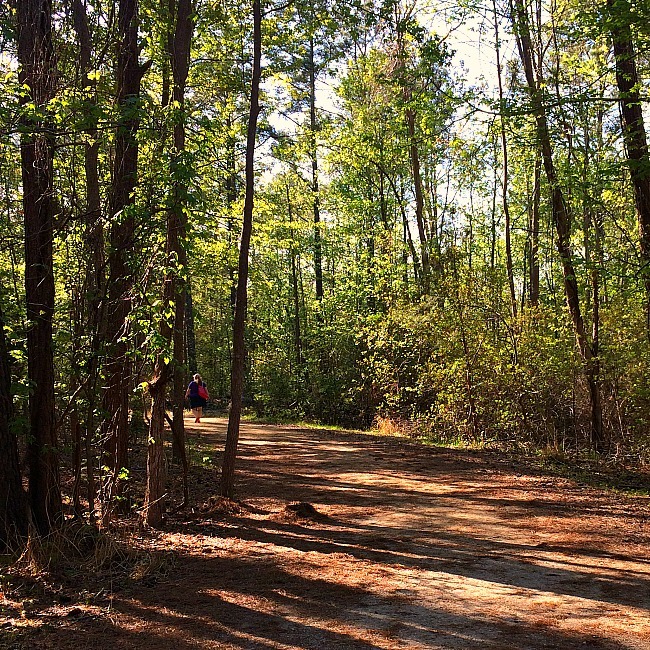 If you want a more extended hike with your kids, there are nature trails that branch out from the main trail. The park will reach capacity on weekend days during the summer. It is a small park (only two parking lots), so I don’t think it feels super crowded even at capacity. However, if you are planning a weekend summer visit, I would get there early. The park hours are 9AM-6PM (weekdays) and 9AM-8PM (weekends) during the summer. After Labor Day, the hours are 9AM-4PM (Monday and Friday) and 9AM-5PM (weekends). The park is closed from Tuesday-Thursday from Labor Day to Memorial Day. Dogs on the leash are allowed! There are no concessions available. Not even a soda machine. So, plan to bring all the food and drinks you will want/need. The admission costs are much lower than other beaches in the area: $4 for county residents and $6 non-county residents during the summer. $3 for everyone the rest of the year. Pack water shoes for the beach. There are a lot of shells and broken shell pieces. It will be uncomfortable to walk back to the trail with bare feet. What’s nearby? If you want a full day trip and are not sure about spending all day at the beach, the amazingly awesome Ann Marie Sculpture Garden is only a 10-minute drive away. I highly recommend this as a super fun place for kids. You can read my review here. Also in Lusby, there are a few restaurants, including a Rita’s Ice. Low Tide! If you are wanting to hunt for treasures, be mindful of when low and high tide are. According to the latest tide tables (for Summer 2016), low tide is in the early morning, and late afternoon/early evening. This would be another reason to get there early– find all the cool sea shells! For more information of Flag Ponds nature park click here for their website. Flag Ponds is a hidden treasure to everyone who has explored it’s shores, mostly because of all the treasures you can find when you visit! Of course, the biggest treasure is the memories you will make with your kids. That treasure is priceless!